Colors can only be changed in the paid packages STANDARD and PRO. Where can you find colors settings? 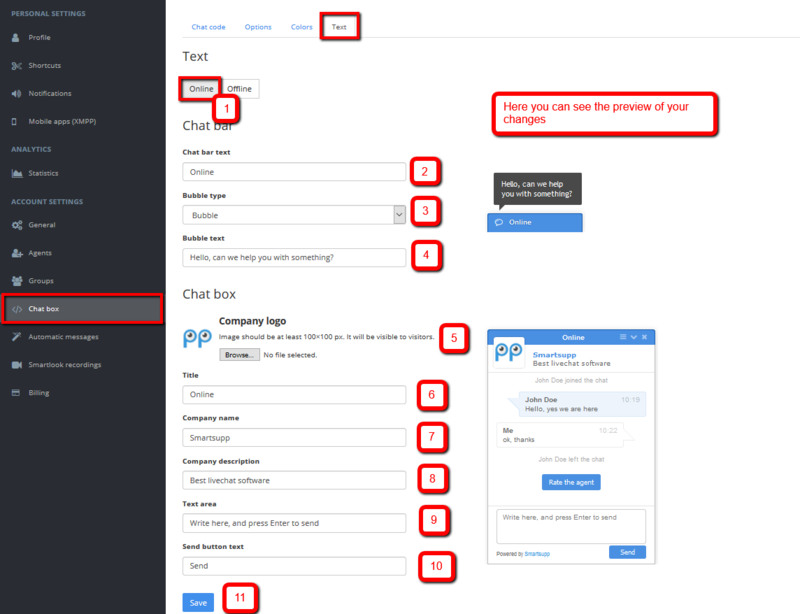 Do you want to customize the colors of chat box on your website, so it will match your website’s current color theme? 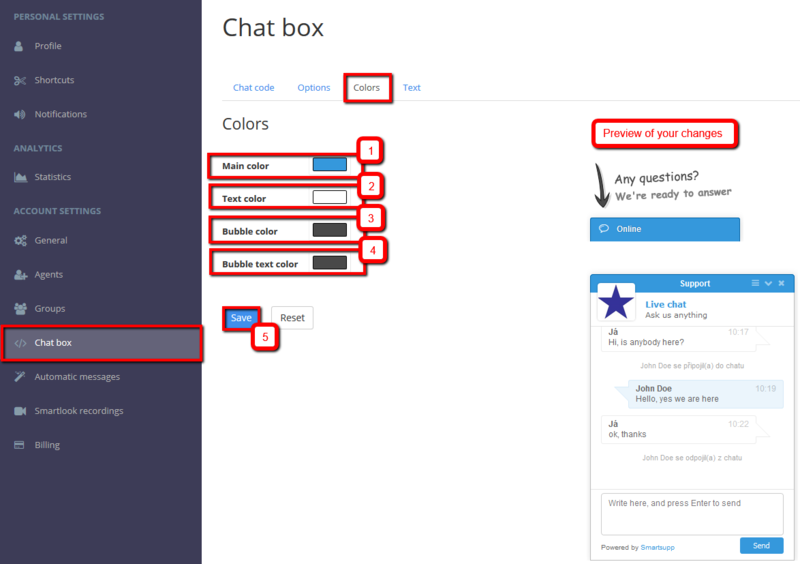 Nothing is easier, you can change colors of Smartsupp in Settings > Chat box > Colors. Which colors can you change? You can change Main color (1), Text color (2), Bubble color (3), Bubble text color (4). When changing colors, there is a preview of what your chat box will look like after the change. When you are finally satisfied with your work, just click on Save (5) and check out what the chat box looks like on your website. Where can you change texts and pictures? 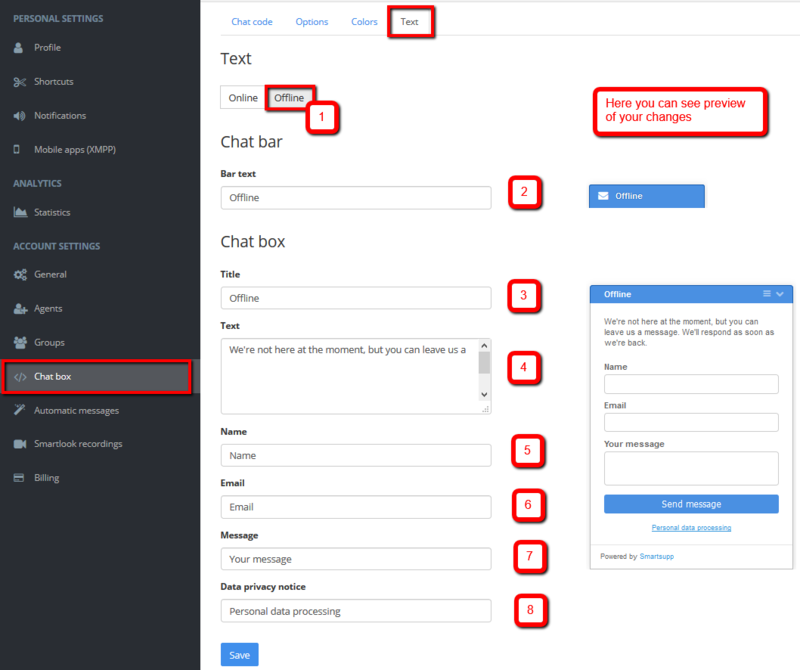 If you are not satisfied with default texts of chat box, don’t worry!. You can change everything in Settings > Chat box > Text. There is a preview of what the chat box will look like after your changes, so you can always see what exactly you are changing. So what can you actually change in Smartsupp settings? We will look into it in this tutorial. Which texts can you change? First, you need to select if you want to change texts of Online or Offline chat box. 3. Bubble type – there are three types: bubble, arrow, or your own picture. 5. Company logo – this logo is displayed in your chat box until one of your agents joins the conversation (is replaced by agent’s photo afterward). 7. Company name – only displayed, until one of your agents joins the chat (it is replaced by agent’s name afterward). 8. Company description – only displayed, until one of your agents joins the chat (it is replaced by agent’s description afterward). 8. Data privacy notice – this notice is displayed in the offline and pre-chat form. You can activate/deactivate notice in settings. Are you a web developer, or an experienced user, and would you like to change additional texts, colors, or pictures? Check out our API documentation for the list of texts, that you can change in Smartsupp (API is only available in paid packages).